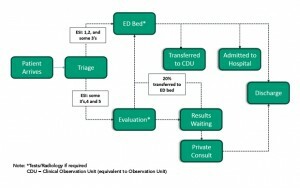 Over the last few years, the Emergency Services team at Northwell Health (formerly North Shore-LIJ) has begun focusing on a “Super Track” clinical model to target effective throughput of lower acuity patient volumes in order to more effectively manage patient wait times and reduce length of stay (A LOS) numbers in emergency departments (EDs) throughout the system. After retro-fitting several EDs to institute aspects of this acuity-based split flow concept (see graphic) and seeing many demonstrated benefits, the team was afforded the opportunity to apply their clinical care philosophy more comprehensively to the design of two new ED expansions within the system – at Huntington Hospital and Southside Hospital. best practice clinical care strategy. 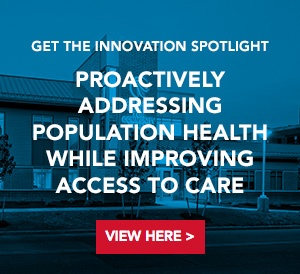 At Huntington Hospital and Southside Hospital, each campus posed unique challenges but a common opportunity. Working toward Northwell Health’s vision for a focused approach to developing EDs based on the Super Track concept, each project began with an analysis of the current state of ED operations by Health Advisory Services, to understand volumes and process challenges, and validate and further inform goals and project footprint for the anticipated project. These activities shaped the functional program. As the new designs at both hospitals developed in tandem, CannonDesign’s teams working on each project remained aligned with regard to the design development, fostering collaborative cross-coordination. For each project, we helped with medical planning and interior design leadership, as well as equipment planning consultation – providing a coordinated approach while allowing room for each project to respond to its site-specific design challenges and influences. A joint project workshop brought user groups from both projects together, along with Northwell Health service line leadership for clinical specialties, including Trauma, Imaging and Behavioral Health, to collaboratively develop the detailed room design and equipment components of the primary program elements. A joint site visit/detailed planning workshop at the newly opened Northwell Health Lenox Hill HealthPlex freestanding ED allowed the newest ED in the system to serve as a living mock-up. There, the teams could validate decisions, explore details, understand initial lessons learned and continue the collaborative development of the new standard prototypes for the clinical components of future Northwell Health EDs. Collaborating with the client has been a great opportunity for the CannonDesign Health Practice team to gain more knowledge of the “Super-Track” model and a deeper understanding of the implications for the model on design and planning. As an example, we have worked closely with Northwell Health on the detailed aspects of the Results Waiting environment, where stable, low-acuity patients await the next step in the care process while freeing up an examination position for incoming patients to be treated. Striking the right balance between a flexible, furniture-based solution and a space that provides for the comfort and amenity of the patient and a loved one, has been the focus of a great deal of thought and collaborative dialogue, informing the design process. By focusing on the processes that enable new care delivery approaches and the new spaces and details that support them, we can, in partnership with our clients, collaboratively shape the next generation of the clinical care setting, responding to the evolving needs of the Emergency Department into the future.